So, another public holiday on a Thursday which translated to movie date with my wife. This was one of my anticipated movie for the summer period, as Pirates of the Caribbean series were also my favorite. It actually premiered in Indonesian cinemas yesterday but we believed it would be exciting to see it at noon in the nearest cinema from our home with the Dolby Atmos sound system, i.e. Epicentrum Mall. After trying new menus in a restaurant nearby the location, we went to the cinema and watch it at 1.15PM show. Well let us get on to the movie now. Henry (Brenton Thwaites - Maleficent, Gods of Egypt etc) was a young man looking for ways to break curse of the sea. He read all the possible literature to help him achieve his mission. While working in a British war ship, he became caught up in the war with a pirate ship. After some incident, he was later found by the British army in an island. He was suspected of treason and was going to be punished by hanging. He claimed that the ship was attacked by army of the dead, led by captain Salazar (Javier Bardem - No Country for Old Men, Skyfall etc) which the Royal army did not believe. Meanwhile a young woman who was accused of witchery named Carina (Kaya Scodelario - The Maze Runner and its sequels) tried to escape from prison. While running away, she encountered for the first time a drunken pirate Jack Sparrow (Johnny Depp - no introduction needed) who was having his own problem with the authorities. Carina who claimed herself to be an astronomer, was looking for ways to find trident of Poseidon based on a diary of Galileo Galilei given by her father since she was born. She heard about Henry's claims and found out that he also required the trident to break the curse. Jack who was no longer having his famous ship the Black Pearl, was left behind by his crews led by his first mate Gibbs (Kevin McNally). He would later met with Henry who told him about Salazar's plan to search for Jack and punish him for what he had done in the past. Jack realized that the trident of Poseidon would be the only way to be free from Salazar. Things also got complicated when Captain Barbossa (Geoffrey Rush - The King's Speech, The Life and Death of Peter Sellers mini series etc) decided to cooperate with Salazar in order to capture Jack. Not to mention the British army who also found out about the secret of the trident which they believed would help them become the king of the sea. So Jack, Henry and Carina would later on embark on a journey to find the trident of Poseidon. Could this unlikely trio achieve their goal? What kind of adventures they would encounter during their journey? Find them all in this exciting entertaining movie. 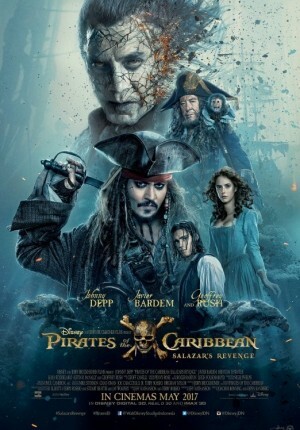 Finally a Pirates of the Caribbean movie that I felt quite at par with the original one. I felt in this movie, the elements of entertainment were quite abundant. Unlike in the 4th installment, I think this one is funnier, more thrilling and gave the sense of happiness at the end. This time,, the movie was not solely telling the story of Jack Sparrow. Instead the other characters, especially Henry and Carina were given quite a lot screen time. It was nice to see Jack Sparrow's charm and wit plus his insistence of helping other people (of course it was also for his own benefit). This movie provided some background story of Jack while he was young, which was very interesting to see. The movie was filled with lots of fun and laughter but also few brief touching moments. The story was good and there were some surprises too. As a high budget movie, the movie was filled with very good special effects (some done by the Industrial Light Magic). I totally loved the effects of the deads (Salazar's crews), his ship and of course the very cool special effects at the end. Btw, I mentioned above that I watched this one in a cinema with Dolby Atmos sound system. This gave incredible sound effects which totally amazed me. The soundtrack was nice and giving the sense of thrill and fun. Now bear in mind though that there are portrayal of the deads in this movie, which might be a little scary for young children. I actually heard one of them cried during the movie. I also felt that the movie did not have any dull moment. From beginning till the end, there were always something interesting to see. My wife and I were entertained throughout the whole movie which was having a duration of a little over 2 hours. Amazingly, due to the sense of excitement, my wife was able to hold going to the bathroom till finished. I guess she forgotten about it while watching. Actually, even though I looked forward to see this movie, I was a bit skeptical at first about whether this one would be good enough. I felt that the 4th one was a little bit dull, and also a bit forced. The story for that one did not feel strong enough and certainly did not give a lot of impression. But this one really felt it was worthy of giving another sequel after this. Especially if you wait till the very end, after the end-credit scene, where we were given something interesting to ponder. Might be the potential story for the sequel? Perhaps if this one is successful enough. Anyway, I believe this one really worth to see. I am happy to see Johnny Depp in this movie which I hope would be a commercial success for him. Since his past few movies were unfortunately not really successful ones. Maybe people grew tired of his acting as unusual characters. So if you are looking for something fun, light, interesting movie with funny charming pirate and treasure hunt story, you should definitely watch this one. I am confident you would be entertained like my wife and I were. Just saw it tonight. I like the acting of the young Jack Sparrow. He was perfect in mimicking face gesture of the old Jack Sparrow.